It started with the pan. Last year, around this time, I added a lovely swirled bundt pan to our wedding registry and Chris said what he always says when I attempt to acquire something new: “Don’t we already have a bundt pan/sofa/shower curtain/cat?” In this case, we did already have a perfectly serviceable bundt pan, but I hypothesized — on the actual registry — that I’d bake five times as many cakes in such a pretty pan. And then, a few days before our wedding last August, Chris’s mom gave him the bundt pan for his birthday, with the understanding I’m sure that it would soon be filled with cake batter. Preferably chocolate. Since then, I’ve baked exactly zero cakes. Much to his credit, Chris hasn’t said a word about the superfluous pan or the lack of baking. That man really deserves a cake — a pretty cake, a cake filled with the sweet, mapley promise of spring. I know most people associate maple with autumn, but maple is now. Sap runs as snow melts in the early, barely-warm days of just-spring. Before buds burst on branches, before blades of green poke up through the soft muddy ground, before watercress and wild leeks and asparagus and morels there is sap, the Earth’s first gift of spring. 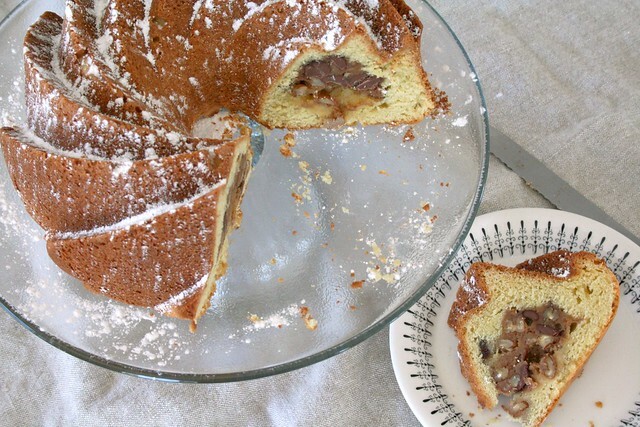 The pure, clear sweetness of maple syrup is the perfect flavor to build a cake around. 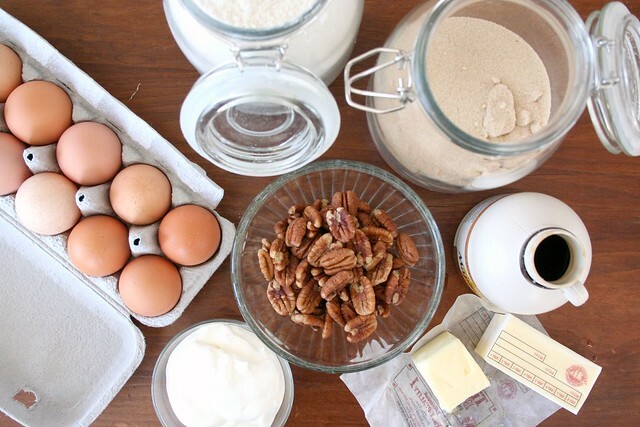 Here, the syrup is mixed with butter, flour and chopped pecans to form a sweet filling that bakes up crunchy and gooey inside a surprisingly light cake with a moist, tender crumb. It’s exactly the kind of cake you want to eat in the pre-green days of late March — light but not fluffy, moist but crumbly, rich and golden and tender with a sweetness that whispers of the coming spring. 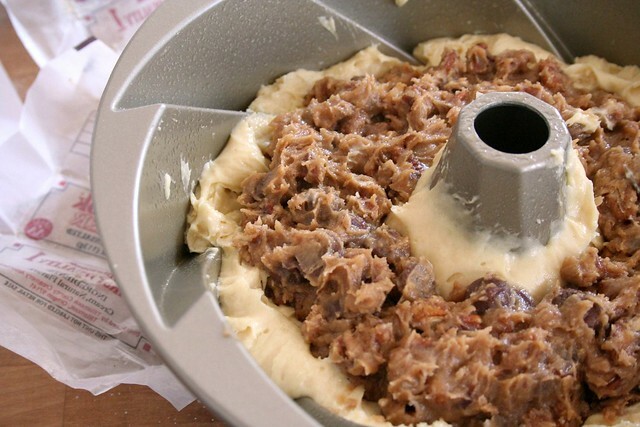 1) To make the filling, place the flour in a medium bowl and cut the butter into the flour using your fingers or a fork. Add the pecans, maple syrup and cinnamon and mix to form a sticky paste. Set aside. 2) Preheat your oven to 350°F. Sift together flour, baking soda and baking powder. Cream together butter and sugar until light and fluffy. Beat in eggs, then add flour mixture. Beat until incorporated and then fold in sour cream. The batter will be thick and sticky. 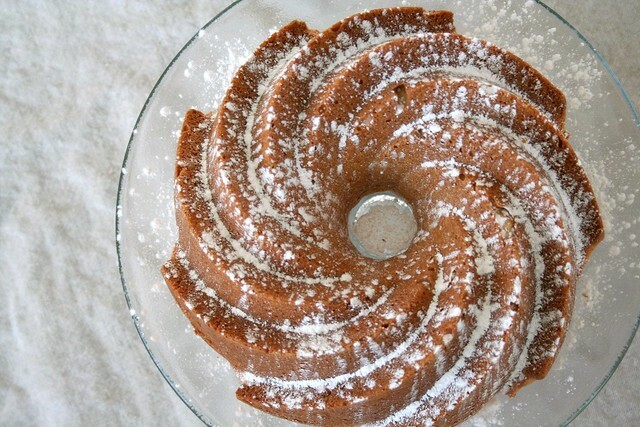 3) Grease a bundt pan and spoon a little more than half the batter into the pan. Spread the batter up the sides and funnel about an inch – you’re creating a little indentation in the batter to keep the filling from leaking out. Spoon the filling into the indentation as evenly as you can. Cover carefully with remaining batter and smooth out the top. 4) Bake for 30-35 minutes until golden brown. Remove from oven and cool for 15 minutes in the pan, then turn out onto a rack and cool completely. Dust with powdered sugar to serve. 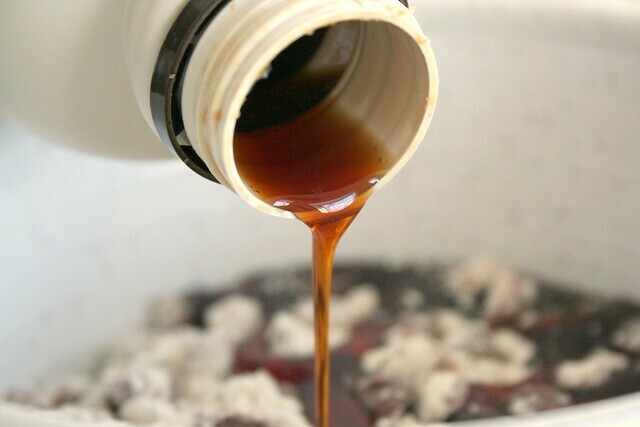 Grade B maple syrup is darker and more flavorful than Grade A syrups, which results in a stronger maple flavor here in the cake. 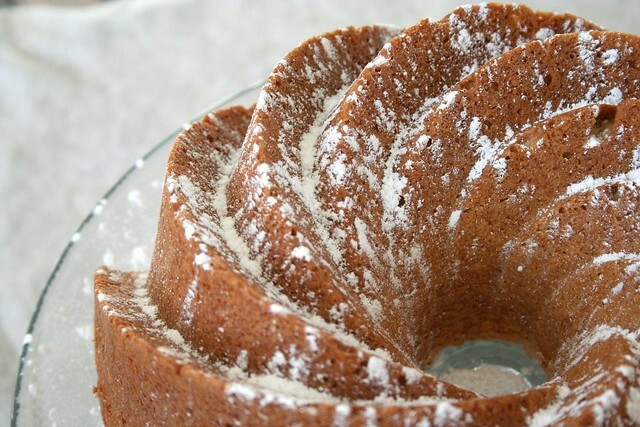 Superfine sugar is often used in cake baking to yield lighter, more tender results. If you don’t have superfine sugar (or don’t want to buy it for just one recipe) plus regular granulated sugar a few times in a food processor to grind it more finely.